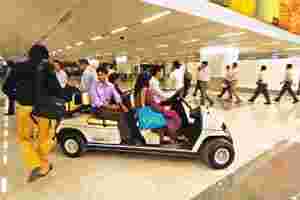 New Delhi: Delhi airport wants to increase parking and navigation charges by nearly eight times, but also wants to ease some of this burden on the airlines by introducing new levies on both arriving and departing passengers. Delhi International Airport Pvt. Ltd, or DIAL, has proposed a 775% increase in aeronautical charges to offset the cost of building the first phase of the Indira Gandhi International Airport at ₹ 11,801.66 crore last year. It also wants to introduce user development fees for all passengers, said three people familiar with the matter, all declining to be identified. The operator already charges airport development fee from departing passengers. “This will mean more money from passengers and less from airlines, who are not in a state to pay," one of them said. The fee is not levied on arriving passengers. The airport doesn’t collect user development fees either, which typically kicks in after an airport is built completely. The Hyderabad and Bangalore airports collect this charge from departing passengers. Airlines add these fees into the ticket price. Delhi airport collected ₹ 778.4 crore in non-aeronautical revenue and ₹ 464.8 crore in aeronautical charges in 2010-11, according to a presentation to investors by DIAL. Given that nearly all of India’s airlines are cash-strapped, DIAL has suggested a graded increase—for example, a 50% increase in the first year, 100% in the second year, and so on. The Airports Economic Regulatory Authority, or Aera, will decide on DIAL’s proposal by the end of this month based on its calculations of the airport’s asset base, depreciation and return on investment. The regulator has sought details on various parameters from the airport operator, said the second person familiar with the matter. Once the quantum of increase is finalized, Aera will issue a follow-on order with the final charges after consulting all the stakeholders. This process may conclude by January, which marks the start of the lean quarter for domestic airline travel. DIAL—promoted by GMR Infrastructure Ltd, Airports Authority of India, Fraport AG and Malaysia Airports Holdings Berhad—has said the Delhi airport will run into losses this fiscal for the first time since the tariffs which are under consideration of Aera have not been implemented so far. Collectively, Jet Airways (India) Ltd and its unit JetLite (India) Ltd, Kingfisher Airlines Ltd, state-owned Air India Ltd and SpiceJet Ltd are weighed by ₹ 84,058 crore of liabilities. In the September quarter, SpiceJet, Kingfisher, Jet and JetLite posted a combined loss of ₹ 1,522.52 crore. The third person familiar with the matter said the airport operator mooted its proposal to charge all passengers to reduce the burden on airlines. But an analyst said the proposed increase in airport charges will only make the airline business “more uneconomical". “Any increase in parking and navigation charges will affect the economic viability of airlines," said Jitender Bhargava, former executive director at Air India Ltd. “They (the regulator) should allow this only when they have explored and exhausted all other means of other revenue generating from aero and non-aero sources."